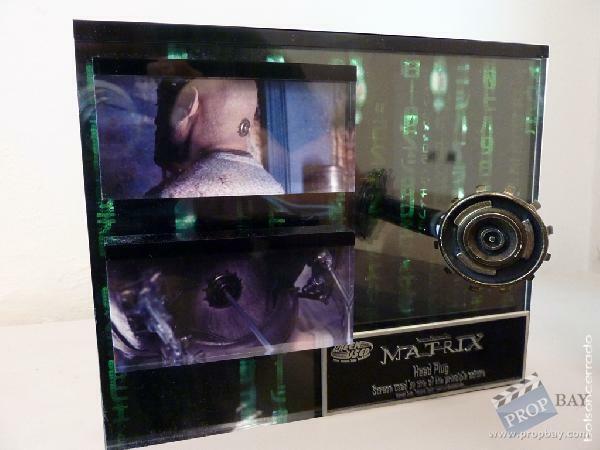 The first Matrix film made a big impact on the way future science fiction movies were made. All new techniques were new, in particular the new effect called "bullet time" used in many scenes. This is one of the head plugs used on screen by one of the main actors. It is not known exactly which actor used this because they were kept aside by the makeup effects team and placed on the back of their heads daily. It could have been Neo, Morpheus, Trinity, or a few others. The piece is displayed in a custom built plexiglass display. The background is a 3D foil lenticular image popular from the movie. Added: 11-05-2011 - Viewed: 3766 times.